50% discount for purchase of this DVD anthology directly from Brooks Books web site! ($14 plus $3.00 postage). 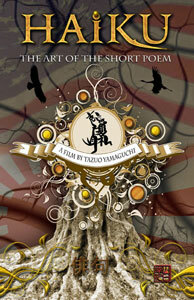 the Short Poem, a film by Tazuo Yamaguchi. The haiku cited or read in the film are published in this book/DVD combo as a haiku anthology featuring contemporary English-language haiku writers. See more information about the authors. 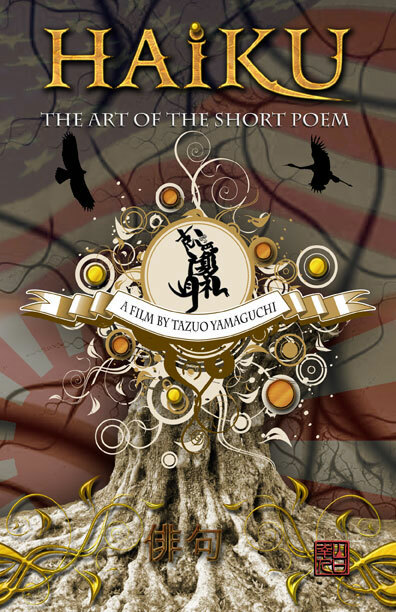 In August 2007 Tazuo attended the Haiku North America conference, where he filmed over 50 hours of interviews and events with contemporary haiku poets, concluding with the HNA head-to-head haiku competition. As Taz writes in the introduction to this book/DVD: "Each poet brought me their wealth of passion, information and knowledge, and timeless insights from their snowball stash they had collected through their life’s sleigh ride of love and interest in haiku." See Tazuo Yamaguchi's web site at myspace.com/PoemStudios or read more details about Tazuo Yamaguchi. Distributors interested in volume discounts should contact Brooks Books at <brooksbooks@gmail.com>. Haiku: The Art of the Short Poem is my gift to the people of the world—to anyone who has even the tiniest curiosity of interest to enter the universe of an ancient, but present-day, haiku amusement park. This film is a poetic playground vividly captured and put into a spectacle by the wonders of modern digital technology. I created it in a simple language of words, motion, color, and sound able to speak to anyone willing to listen and let their thirst for wonder feast on its counsel. discovered by my Japanese people in Japan during the late 1600s and it is still alive and well, now being spoken and written in diverse ways throughout the landscapes of the English language. This film is a modern textbook speaking with a multimedia tongue telling the tale of this short poem. The tale begins with humble beginnings where the inventors, Bashô and Issa, used haiku as the most sacred medicine from their humane inward garden of sorrowful profound laughter. The story follows haiku’s incredible journey across the Pacific Ocean in the Zen nap sack of Nanao Sakaki and R.H. Blyth. Haiku is on the road with the cigarette-stained palms of Kerouac, Snyder, and Ginsberg who played its beat into the minds and hearts of Sonia Sanchez, Bruce Ross, William J. Higginson, and Garry Gay. This tale brings us to the present day with haiku firmly rooted in the lush pages, pens and mouths of a wide open field of contemporary poets who I had the wonderful opportunity to interview and capture into this breathing document of a film. Haiku: The Art of the Short Poem is made of language, fiber, and poetic nutrition. Share it with as many people as you can. Because we all breath the same breath ... Sonia calls haiku. If you are just getting acquainted with haiku, Haiku: Art of the Short Poem is a great crash course in haiku with its eye-popping look inside the contemporary English-language haiku community. While watching the video, I felt immersed into the lives of the haiku poets. The English-language haiku writers are an active community not only producing work, but rapidly growing in size and variety. While solitude and loneliness are valued as aesthetics in both the Japanese and English traditions, this film shows that the poets agree with William J. Higginson when he asserts, "What is haiku for? Haiku is for sharing." Haiku is a social art. Haiku: Art of the Short Poem is Tazuo Yamaguchi’s way of sharing the art of haiku. This film provides an open door to writers who have helped lay the foundation for English-language haiku traditions. Yamaguchi has found a way to share not only his own journey and experience, but the life experience of the haiku community itself. I see this film as an invitation—to learn more about haiku, to find a new poet to follow up on, to become more involved, and to share one’s own experiences through haiku with others, whether or not they’re familiar with the art. If you are interested in booking an interview or performance with Tazuo Yamaguchi, here is a more detailed biography.